I write like I talk. Too much. It’s because I’ve got so many WORDS whirring around in my head at all times and I have to get them emptied out on occasion. That occasion being Constantly. The thing is, anyone who comes to this blog via a creative connection, hoping to see what it is that I do with my hands, will be saying; ‘WHOA!! YIKES!!!! Too many WORDS!! Get me outta here!” And I'd never see them again. When I started this blog back in 2007, it was with the intention of using it as a tool to showcase my work. Somehow, it took on a life of its own and I find stories pouring out of my fingertips; stories that are really of little interest to many/any. I’m just basically talking go myself; and that’s okay. Writing has always been a passion and it gives me an excuse to Just Do It. However, I am keenly aware that it is not serving the purpose for which it was originally intended. So am I getting back on track? Nope. Too late for that. I’m taking another train. I have started yet ANOTHER blog. Imagine – three blogs for the person who couldn’t stand the word BLOG. It wasn’t the concept that bothered me, but the actual word ... it sounds 'gaggy' to me. Or boring ... a Blah...gg. This new addition will be not be WORDY. I will work at keeping them to a minimum. It will soley be about CREATION. What I’m working on, what I’ve just finished. I’d like it to be more interesting than just things that I make, so I hope it could become more interactive where people could ask questions or share tips about techniques, products, ideas … that sort of thing. If it was creatively interesting/educational, hopefully the words will be relevant and tolerable. Everyone who signs up as a follower, up until January 31st, will have a chance to win an Ol'Soul who will be touting my favourite saying: "Take my advice, I'm not using it." I shall continue to share the musings of my head and my heart right here on EVolution, and I will continue to practice my photo art and share my favourite quotes on The Daily Muse. Meanwhile, over on the other channel, it will be what comes from my head, my heart and my HANDS ... nurtured by a creatEV soul. PS There's a link button at the top of this page. PPS: I would love to share the blog links of other creative souls - let's TRADE! The weather here for this entire year has been nothing short of spectacular. It was reported that the farmers have enjoyed their most bountiful crops in history and that is a quite LONG time. Winter was easy - we didn't have a single day that we were snowed in (much to my personal disappointment); spring - I can't remember, but I suspect that I would if it had been rainy and miserable; summer was glorious and this autumn has been heavenly. And NOVEMBER. 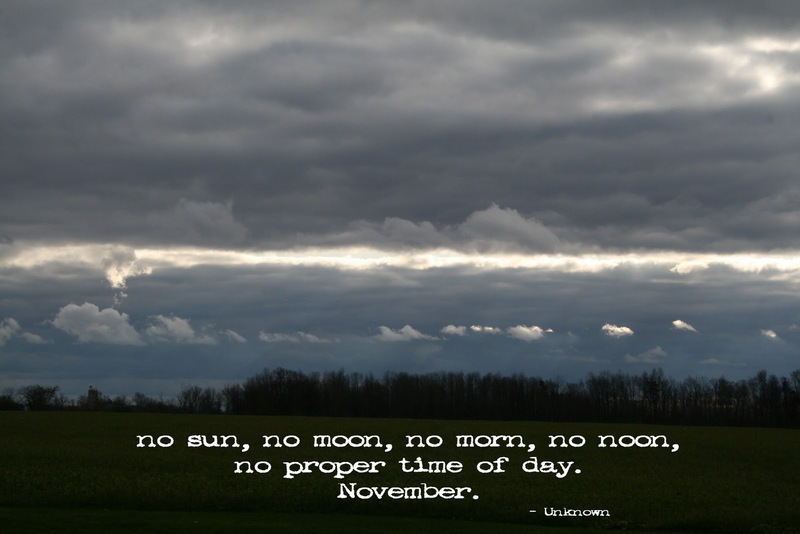 Well ... November to me is a morose month - gray, drab, damp and cold. 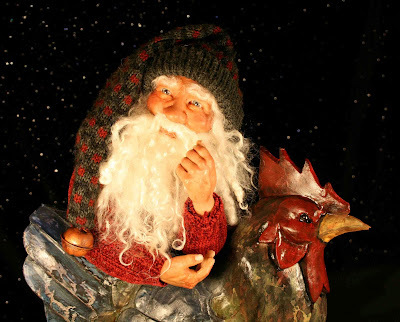 It's a Nothing month; a pit between vibrant, dancing October and joyful, memory-making December. It could be that I have made it into a major disappointment in my mind because I am so in love with October. Perhaps I feel it would be disloyal to her, considering our intense relationship. December has my attention for reasons other than nature. The internal and eternal light of Christmas offers a soft glow that feeds me. November has offered me nothing. November is a shroud that hangs over me, enveloping me with its grayness. I am not a fan of grayness. November is IT to me, not SHE. October, she dances. December, she glows. November, it hangs. This year is remarkable. 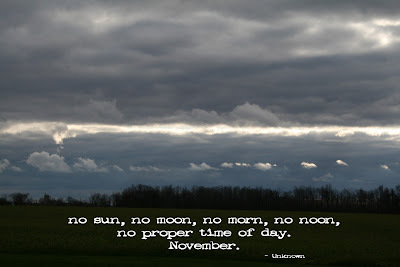 I have not even been able to use the November quote on my Daily Muse blog because that type of day has not yet come. If it weren't for the bareness of the trees, I could call this Indian Summer. I have been looking for things to do outside each day, even though I should be up my studio, focused on the task at hand. I have been sitting on my back porch, in awe and gratitude. People from the south would not begin to understand what I'm talking about, but people around here surely do. So ... the other day, I was 'sitting in awe' and the lake called me. She said 'COME! Come before it's too late!!!!' I try to listen to my inner voices, which actually is what keeps me going in circles for the better part of my days. I asked two photographer friends if they wanted to run away with me and spend the afternoon on a photo shoot excursion at the lake. When the weather is so unseasonably warm, our first thought is that we need to focus on all that yard work that we often get stuck doing in the bitter cold, or the Christmas decorating that usually has to be done with mittens on. So when my friends said 'SURE! ', I was delighted. I wasn't overly surprised as they are spontaneous and adventuresome friends - MY kind of people - that's why they are My Friends. They are also very rich in wisdom - knowing that an afternoon spent with friends who share a passion, will carry us further than a raked lawn or clean windows. It was glorious. The sky was October blue. The waves, which can be as crashing as the ocean, were quietly lapping in a meditative rhythm. There were brilliant golden leaves lit up at the tops of the poplar trees. They were like celebratory flags, remnants of the autumnal bliss refusing to give way to November. In the distance, it looked more like an illusion of mist than the real thing. It was a soft and gentle day all round. There were treasures found. Interesting rocks and sand scrubbed driftwood but the most significant was a beautiful piece of rare aqua beach glass. A gem that had been tossed and churned for countless days and then graciously deposited right at the feet of a grateful treasure seeker. Although together, we were each in our own space and time. The lake allows that. There were very few people there, which added to our feeling that we owned the day and the place. But we watched with interest, a group of young people, in and out of the water in little boats. It was apparent that the group had a purpose, and when we walked by we were a little taken aback by an obviously lifeless body bound up in blanket. We couldn't let that go without asking, so a nice young man explained that they were shooting a movie and that was 'Henry'. We wondered whether Henry was being dumped or recovered, but he couldn't or wouldn't say. The young man, I mean - Henry wasn't talking at all. Although it was too late for poor old Henry, we wished the young man well and carried on with our own mission - capturing the day. Generally, in my mind, there is nothing to take pictures of in November. Dry and dead leaves, sad and hopeless flowers, withered vines... even the naked trees that I actually do admire, are sullen against the drabness of a timeless sky. Unless they have light and shadow they do not dance and they do not speak to me. But this day, they not only spoke, but they sang on our evening drive home. It was a strangely moody tune of hazey pink that made all three of us feel that we had been transported to somewhere foreign and exotic. It was too elusive to capture, which is appropriate as it was a feel rather than a vision. November, you have redeemed yourself in my eyes. You have showed me that there can be another dimension to absolutely everything, even to drabness. I greatly appreciate your gift to me. I wonder though, was that gift, that lesson more about ME than it ever was about YOU. About ME taking the time to see and appreciate what is in front of me - black or white, colour or gray, naked trees or vibrant. About ME needing to be told again and again and again: "Everything is something." One day, when I was a teenager, my mother ventured into the storage room that she had aptly named ‘The Hell Hole’. It was a room in the basement piled sky high with mountains of stuff. If it was consigned there, it was never seen or thought of again. There were times that I was keen to explore it and see what secret treasures it held, but it was impossible to get further than three feet past the doorway. "You take your life into your hands when you go in there." my mother would rightly declare. It was therefore quite remarkable that she had found and dragged out an old wooden trunk. There were hundreds of letters, tied in bunches with ribbon, which she was systematically destroying. I asked her what she was burning. 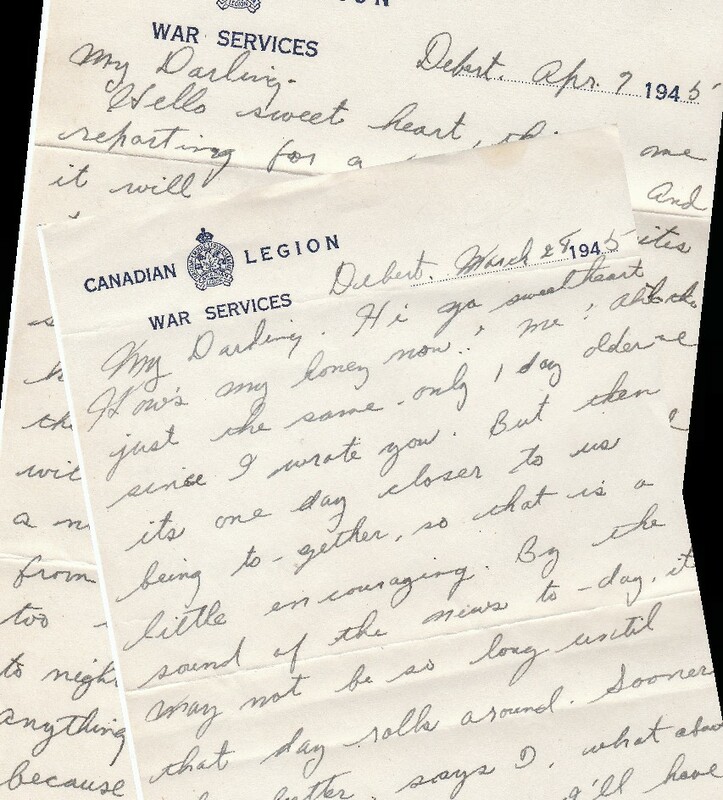 “Letters from your Dad when he was in the army.” she replied. This from the woman who had invented the Hell Hole and filled it to the brim with every little thing that had ever come into her life, or ours. And I really do mean 'every little thing' - the Hell Hole would have qualified for the Hoarder's show. “Don’t do that!” I protested. “Why would you burn them?” “Because they’re mine and they're personal.” she said with surprisingly little emotion. A strange and unfortunate moment that I wished that I had not witnessed. She missed two. We came across them when we were cleaning out the house. I have them and likely should feel guilty, but I don’t. It has given me the smallest glimpse of their life during those years. They are crisp and unwrinkled. I picture my Dad writing them on his bunk, and my Mom reading them over and over, running her fingers over the words. That they have remained in such pristine condition for 65 years is amazing. My Dad did not go overseas because of medical issues, but nonetheless it still stole three years from them. They were newlyweds with a baby girl, and being stationed in Nova Scotia would not have been much different than being across the sea in terms of travel and communication. No Skype or email. The story went that when my Dad had originally gone to sign up, which would have been before he was married, he was told that he was not eligible because of a past injury. So he carried on with life, and was totally blinded sided when one day just months after they were married, he was met at the track by uniformed Military Police with a warrant for his arrest. 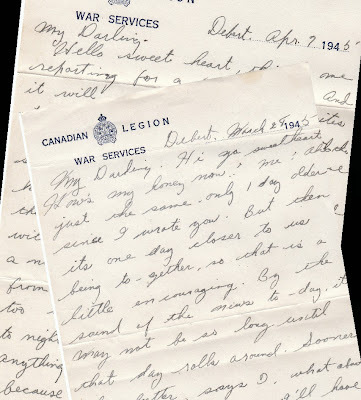 Apparently, a conscription letter had been sent to him at my Mom’s family home in Toronto. Her sister, thinking that he wouldn’t have to go if he never got the letter, had destroyed it and never told anyone. There was little time for goodbyes as they shipped him off, leaving Mom to manage on food stamps, in a strange town far from both their families. The only person that she knew was their landlady, Mrs. Culbert. In my mind, I picture this woman I never met to be an elderly angel because I have a feeling that she saved my Mother's sanity during those years. I’m so glad that the two letters survived. It has given me an image of my Dad that I never got to see – a young man deeply in love and missing his wife. My Dad was not young by the time I came along. His written words were brief: 'To Ma: Love, Pa and the Kids'. He was witty and silly, he was not mushy or demonstrative, so his romantic words to my Mother are a real treasure. Perhaps it was that which made her uncomfortable sharing them; or maybe it was just a weak moment more to do with something else that was going on in her life. At any rate, it still is a curious thing to me and I am ever grateful for the two I have. I share a snippet of them with my apologies to my dear mother: "Sorry Mom …but I am the Keeper of the Memories now and I think it’s important that our generation and the next and the next, understand and appreciate the sacrifice that you all went through – even those who did not fight and those who waited at home. We have the responsibility to keep the humanity in history - the faces; the voices; the tender hearts." Hi ya sweetheart. How’s my honey now? Me? Ah, just the same – only 1 day older since I wrote you. But then its one day closer to us being together, so that is a little encouraging. By the sound of the news today, it may not be so long until that day rolls around. Sooner the better, says I. Guess I’ll have a little trouble writing, cuz there’s a few sitting around here shooting the sh--, and you can imagine what they’re talking about. I just remembered Darling that it’s getting around Easter again and I’d better send this card. It isn’t so good, but at that I’m kinda lucky to have it. Anyway, I send it Darling with my deepest love and best wishes for a happy Easter. Surely by next Easter we’ll be settled together and happily for life. We have been thinking at each season; anniversary, etc that we would be together the next one, but they still keep going by with us miles apart. Surely, our luck will soon change, Darling, so keep your chin up for awhile yet. My Darling… Do you remember April 11, 1942? That was the day you put your foot in it, eh! In one way it seems ages ago and in another it seems like only a short time. Guess if we had been together all the time, it would have seemed much shorter. Gee, I hope that we spend more of the next three years together. If not, I don’t know what I’ll do. Surely the Good Lord won’t keep us apart much longer. Well my Dearest, I have to go, so will send my truest love with the card I got and hope it’s the last one I have to send you and will be able to hand you the next 60 (in person). Yes, I love you Darling, more and more all the time. And the children. I can only imagine the emotion that both my parents felt. I have a thousand questions for my Mother that will forever remain unanswered. I didn't have the questions until we found the letters and it became real. It was when I heard the voice of the words that I finally pictured them as a young couple, and began to understand the scope and depth of that time in history. I wonder if my mother ever regretted destroying those letters. 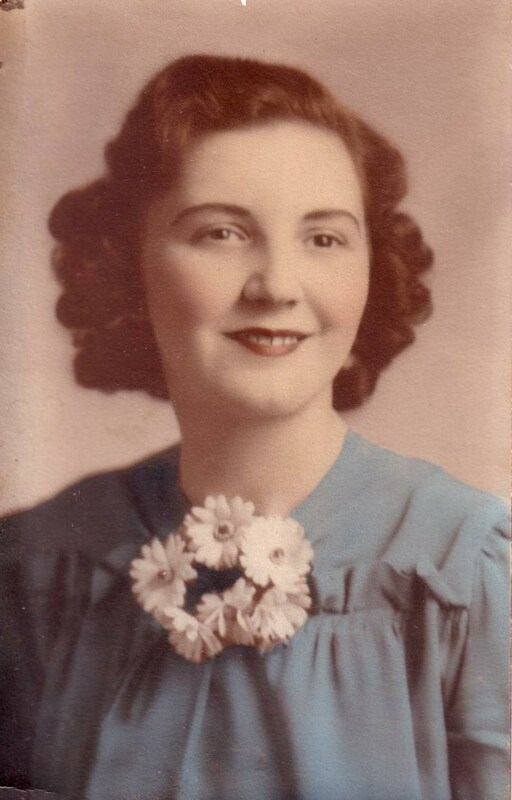 I suspect as she aged, that they would not have seemed as much personal or embarrassing, as loving and wonderful; a testament to their youth, their love and the difficult time that they endured. We are charged to REMEMBER. We can do that better when, along with the facts, we are given the faces and the souls. It is when the human stories make their way into our hearts that we remember and understand best. Well, it’s got to be done. A while back I wrote about the theory that my finally-wonderfully-strong nails had to be from the fact that I had been drinking a pint of Guinness each and every one of the fifteen days that I was in Ireland in May. As I feared, the effects have worn off. My nails are right back to how they have always been – soft and tearing. Nasty. There’s only one thing I can do. Get back on the Guinness. I’ve been talking about it for a few weeks, but I am too cheap to pay $22 for eight cans of beer. I don’t even like beer. I won’t pay $36 for a bottle of Bailey’s, which I really do like, so it’s highly doubtful that I would open my wallet for beer - nail health or not. When we were watching the feature on 60 Minutes about Zenyatta, that incredibly beautiful, magnificent thoroughbred mare, they said that she enjoyed a Guinness after a work out - the only beer that she’ll drink. "See. ", I said to Brian, "There must be something to it." Friday night, Brian, being the sweet and thoughtful guy he is, came in with a case of Guinness. AND a bottle of Baileys. So mid-day yesterday, I had a nice hot bubble bath, cozied up in my robe and a blanket and poured myself a beer ... in a wine glass. Decidedly decadent for me in the middle of a Saturday afternoon. It didn’t taste the same as the ones that were on draught at the pubs in Ireland, but I got it down. Medicinal purposes, ya know. A little later, my son went to the refrigerator and I heard the ‘pssst’ sound of a can opening. My gasp was totally involuntary. Brian was sitting here too and he laughed hysterically. Standing with his coke, Daniel looked confused. "Oh," I quickly assured him, "It’s okay." I had no intention of confessing what had caused my reaction. Brian was still laughing "She thought you had one of her beers. ", he said, "She'll tell ya - you can have all the food you want in this house, but just don’t touch her beer!" "That's RIGHT", I confirmed, "I'm serious, definitely, do NOT touch MY beer." So.. now I have to make sure I drink the Guinness every single day for two more weeks. Actually, I’ll have to make it 15 more days because there are eight in a case. It’s gotta be done. I’ll report back how my nails are. And if I win any races.